It’s crunch time in the NFL. While there are some seeding issues left to resolve, there more importantly are three wild-card spots up for grabs and six teams still hoping to grab one. 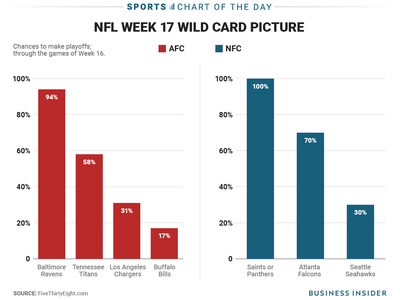 In the NFC, things are fairly simple as one wild-card spot will go to the New Orleans Saints or the Carolina Panthers, whichever team does not win the NFC South. The other spot will go to the Atlanta Falcons or the Seattle Seahawks. According to simulations at the data-journalism site FiveThirtyEight, the Falcons have a 70% shot of securing the final NFC spot. Things are more complicated in the AFC, where four teams are still alive for the wild-card spots. The Baltimore Ravens, who control their own destiny and can still get in with a loss, have a 94% chance of snagging a spot. Things are more up in the air for the final three teams, but the Tennessee Titans (58%) have the best shot for the final AFC spot.